If you are looking to host a business gathering or family occasion, look no further than Russia House Restaurant. The dining room is spacious, but intimate too, with tables lining the walls. The walls are decorated with large paintings of Russian scenes and large painted paper mache caricatures of historical Russian figures that sit on top of the long wine rack. When you glance out the tall windows of the Russia House which is set in Historic Herndon, you will see the 19th century buildings across the street, with shoppers leisurely walking down the street. During the week, classical music plays unobtrusively in the background. 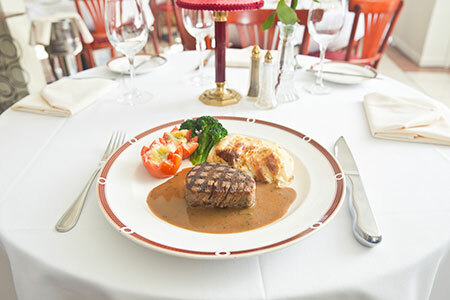 This restaurant is a perfect place for a romantic dinner for two, or a large corporate dinner or lunch. The Russia House can be booked for weddings and other special events. Just give a call to make a reservation for any special event that you may be planning.